What Deck Railing Design Is Right For You? What kind of a lifestyle you have? Do you like spending a lot of time outdoors with your family? Perhaps you like to do a lot of barbecuing, and prefer to entertain your friends outdoors! Under such conditions you would be better off with a bigger porch or deck than if you were to use it once in awhile. Most of the time you are expected to have a porch on the front of the house. But, it may just so happen in your case that it’s too hot around the time when you most like to use it, Or possibly you have a striking view towards the south, or you like to have it facing west if you love watching the sunsets. Visualize the point that would offer most enjoyment beforehand. It’s very common for people to have wood or metal for their porch and railings. You may already be aware of other available materials and you have to look for something that will go with the style of your house. Some home designs may not go too well with metal railings. For instance, homes with Victorian or country themes look far better with wood railings and show a continuity of design. A modern-day home may look better with metal railings. Some people are not in favor of using wood as it necessitates maintenance, but even metals entail some maintenance. It all depends upon the kind of maintenance you feel comfortable with. One may find it easier to varnish wood than to scrape off rust from iron railings. The selection of railing material is to a good extent also depends upon where you live. If you happen to be in an area close to water that remains humid. wood may not be the ideal choice as it attracts mildew and would rot in the moisture. in such a case it will be worthwhile to use metal as it’s more durable and can resist moisture better than wood. Moreover, you get more options of designs in metal than in wood. So, these are the major points that need consideration when deciding the railings for your home. But, at the same time, you should compare the cost of different options, as also the features that matter most to you and which of these can you for go to save money. You have to keep in mind the lighting arrangement and other features of the deck railing that may help saving money, yet give it a unique touch. And, last but not the least, the ease of installation and the time you can spare for doing the needful. 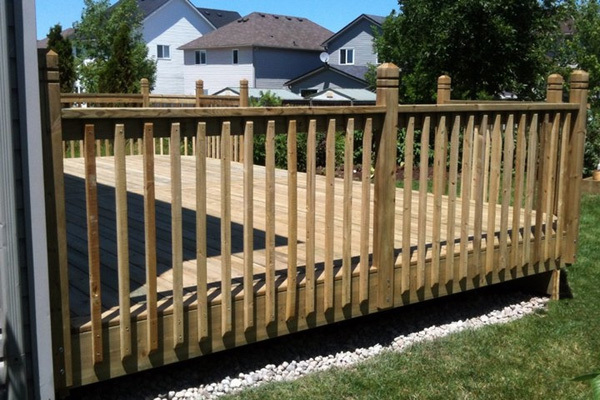 Call the professionals at O’Leary and Sons and they will assist in your decking needs!